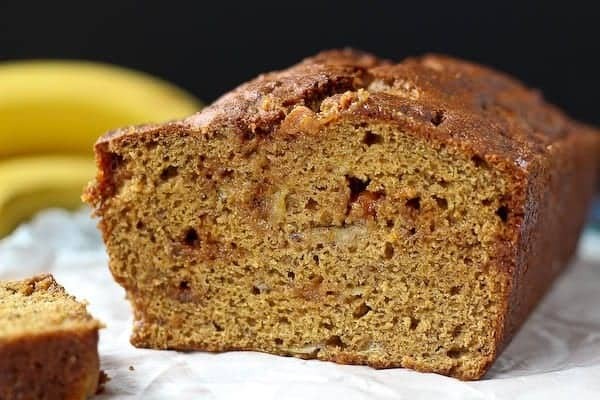 This whole wheat caramel banana bread uses very little oil and 100% whole wheat flour. The caramel bits add the perfect touch of sweetness. I bought some disposable tin bread pans at the store today so I plan to bake up some little loaves of bread and wrap them up in pretty cellophane. 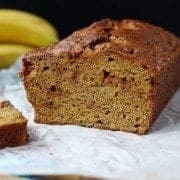 I was planning on my regular whole wheat banana bread but since it’s Christmas and all, I might throw in some caramel bits like this banana bread. 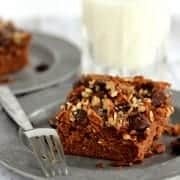 Ooooor I could do coconut chocolate chip banana bread. Or chocolate banana bread. Or maybe I have a banana bread obsession? Truth be told, I live with a bunch of monkeys who eat bananas like it’s going out of style so I’ll be lucky if there are any bananas to use. I go through at least 3 big bunches a week, usually more. And I hardly ever eat them. The cashiers at the store always comment on it. Seriously, 75% of the time, there’s a banana comment happening. Yes, we eat all of these. No, they might not last us through the week. No, I do not live with actual monkeys. Yes, they do climb on me like monkeys. Okay, maybe that’s not exactly how the conversation goes, but pretty much. 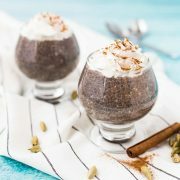 If I’m all out of bananas it will probably be pumpkin bread or perhaps I’ll try something new. Any suggestions? I have a huge bag of frozen blueberries so maybe I’ll put those to use. I hope no one from Ben’s family is reading this. Surprise, you’re getting bread! Maybe it will be maple stout bread! That would be fun. 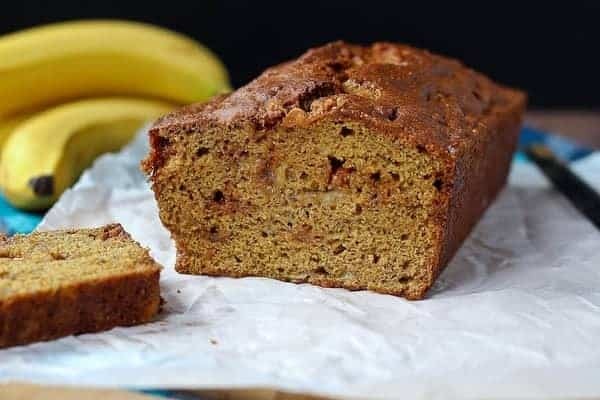 This whole wheat banana bread uses very little oil and 100% whole wheat flour. The caramel bits add the perfect touch of sweetness. Heat oven to 350*. Spray a 9 by 5 loaf pan with nonstick cooking or baking spray, set aside. In a large bowl, mash bananas (I use a potato masher). Add sugar, applesauce, oil, vanilla, and eggs. Stir to combine. On top of the banana mixture, add flour. Make a small well in the flour and add baking soda, baking powder and salt. Stir gently to mix the dry ingredients on top of the wet ingredients. Stir everything together until just combined. Fold in caramel bits. Pour into loaf pan and bake for 50 minutes to an hour or until a knife inserted in the middle comes out clean. Transfer loaf pan to a wire rack and let cool 5 minutes. Run a knife around edges of bread to loosen from pan. Invert onto rack and turn bread out of pan. Let stand until cooled completely before slicing (if you can wait that long). This freezes well. I almost always double the recipe and wrap one loaf in foil, then put in a freezer zip-top bag and freeze. Note: Instead of making a well in the flour for the rest of the dry ingredients (step 3), you could pre-mix them in a seperate bowl. I don’t like doing dishes so I always do it the way I described in the directions. It turns out great every time. 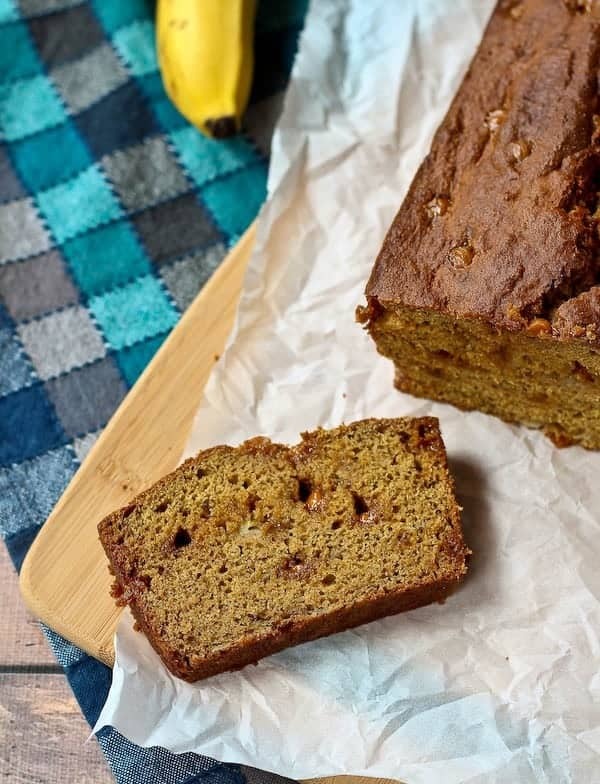 Verdict: What’s not to love about caramel banana bread? Husband’s take: He happily devours this bread.